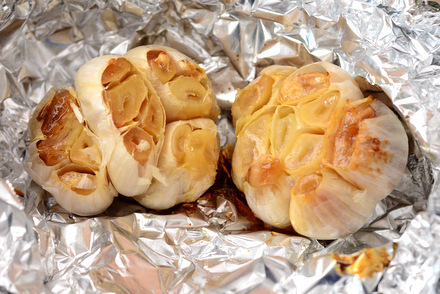 Roasted garlic is my favorite way to eat garlic. While garlic has a strong, sharp flavor while it is raw, it also contains many natural sugars that can caramelize when exposed to eat. Roasted garlic has a rich, sweetness to it – as well as plenty of garlic flavor – but none of the sharpness that we usually associate with raw garlic. I’ve got a great post up right now that will help you learn How To Make Roasted Garlic over on the Craftsy Blog (it’s free! ).Â In addition to the tips for roasting garlic, I also included a recipe for Roasted Garlic Butter that is perfect for serving with biscuits or rolls at your next dinner!Â You can add the garlic to soups, roasts and all kinds of other dishes to infuse them with delicious garlic flavor, as well.